Mr RK and I decided to abandon the garden for the day and take a trip north, up the coast. It was our anniversary. In better economic times, we would gone to Mexico for a long week-end of warm beaches and fruity drinks. Being unemployed and in cash conservation mode, we decided to head up the coast. The beaches south of us would have been warmer but they closed the Bay Bridge for repairs this weekend, so going south (and dealing with the traffic) would be nothing short of insanity. Our first stop was Bodega Bay. This area became internationally famous when Alfred Hitchcock made the film “The Birds” there in 1963. 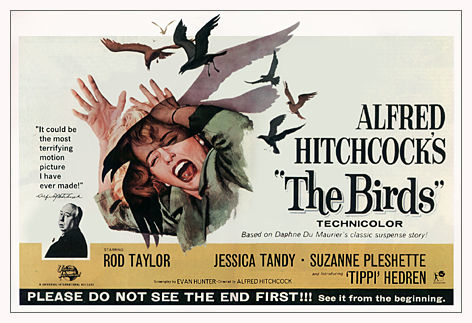 The plot synopsis is: A wealthy San Francisco playgirl pursues a potential boyfriend to a small Northern California town that slowly takes a turn for the bizarre when birds of all kinds suddenly begin to attack people there in increasing numbers and with increasing viciousness. I have to say, this movie scared me, A LOT, when I first saw it as a kid. It could give you a serious fear of birds. I do wish I had one of these original movie posters. If you go to the visitors center center in town they can tell you where the school house is and other landmarks from the movie. Rent this if you haven’t seen it, it’s a classic! We took a long walk on the beach. You can’t really swim here, it’s not safe, but the water is so cold you wouldn’t want to anyway. Sometimes you can watch the wildlife. Then we drove farther north to Jenner. Jenner is a little town, population 170, where the Russian River runs into the pacific ocean. Well, it does at high tide. At low tide, the seals get stuck in the river for awhile. Below is a picture of the seals looking toward the ocean, wondering when it was coming back. You can see four of the six that were waiting here. After I took this picture, they seemed to get tired of waiting, not willing to make there way across the sand and went back into the water. for a snack of the local cuisine.